Fall is in the air, and that means songs about apples, pumpkins, and leaves. It also means a new pitch on Music Street for 2nd graders! We've been learning about "Do" in 2nd grade the last few weeks. Do lives at the bottom of the Music Street. You might think of it as the first note of a musical scale, or "Do, a deer, a female deer" if you are a Sound of Music fan. We often find Do at the beginning and end of a song. In "Apple Tree," we go the entire song on Sol, Mi, and La, and Do sneaks in at the very end. The students decoded the solfege and rhythms in this song, then we added back in the words. After we had learned the song, we added a bass xylophone ostinato (a repeated pattern) and the game. See if you can figure out how the game is played from the videos of 2nd graders below! There are also some photos of the game, song, and instruments in action. 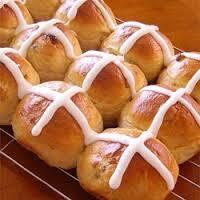 The song name "Hot Cross Buns" usually elicits some giggles from students. Our American brains don't immediately make the connection to the tasty baked good this song is about. This is a folk song from England about a bun eaten on Good Friday. It is a spiced sweet bun filled with currants or raisins, and there is an icing cross place on top. In previous years, I've spotted hot cross buns for sale at Panera Bread around Easter time! Hot Cross Buns ready to eat! Doggies, Bears, and Beat Buddies--Oh My! We use our imaginations in the music room all the time! This week, 1st grade and PreK/Kindergarten have been pretending to be animals in two fun music games. We use games in the music room to practice the musical concepts we've been learning about. Play is such an integral part of childhood that it helps children grasp and remember ideas. We are learning about high and low sounds in 1st grade. Last week, we met two friends on Music Street named Sol and Mi. This week, a new friend, La, moved in. La lives higher up the street, so he has a higher sound. And, just because they did such a good job with the Beat Buddies and showing opposites, here are a few pictures of the class in action! We learn these concepts through experience of the music--with our voices, with our bodies, with instruments, and with play. This week, we are experiencing pitch and rhythm with the fun song "Engine, Engine, Number Nine." After we learned the Sol-Mi patterns for the song, we learned the words and the rhythm, learned the instrument part, and played the game. All of this was accomplished in 40 minutes! :) Below is a video of a 1st grade class combining all these elements. Have You Ever Heard Such a Sound? This week is a BIG DEAL in 4th grade music class. The student received their recorders!! Our first lesson includes how to put the instrument together, how to use steamy air and hole-ly fingers to produce a great recorder sound, and how to start our air with a "too" sound. The students have done an amazing job! A lot of patience is required for this very first lesson, and the 4th grade classes have made me so proud! So, what does a brand new recorder player sound like??? Watch the video below for a 4th grade class making some of their very first sounds on their recorders. I think they sound great! And, 4th graders, remember to click on the "Recorder Resources" tab at the top of the page for your very own section to this website! Added Bonus: Here's the link to the Recorder Master Game! Lost Pockets, Howling Wolves, and Review Galore! In 2nd grade last week, we reviewed three pitches from Music Street--Sol, La, and Mi. These three pitches (or musical sounds) make up a bunch of songs. We learned the song "Lucy Lockett Lost Her Pocket," which has a fun guessing game that we play while we sing the song. We also added in a simple instrument part on the bass Orff instruments to review our technique. Singing games like "Lucy Lockett" really help to reinforce the concepts we're learning. Plus, they are fun! Waiting to start the pocket-passing! We also reviewed the pitches Sol, La, and MI in 3rd grade last week. Plus, we reviewed basic quarter note and eighth note rhythms. We learned the song "We Are Dancing in the Forest" and the students figured out ALL the rhythms and pitches in the song. Then, we added some Orff instrument parts for review. On the Orff instruments, we use the 3 B--Bicycles, Bounce, and Belly Buttons. We hold the mallets like we're holding bicycle handle bars and we bounce off the middle, or "belly button," of the bar. We also used the the big low drum to help get in the feel of a wolf prowling around. Here are videos of two classes with instrument part, the singing, and the game in progress. And here are some candid shots of the 3rd grade classes! We have some new friends in PK and Kindergarten music class--the Beat Buddies! Everyone gets to have a buddy to help them show the beat. The students have loved using the buddies! The video below shows the students using their buddies to show whether the beat of the music is FAST or SLOW. More pictures of the students with their buddies!